Tuesday and Wednesday, we mostly spent cleaning up the shop. What a mess we had made! We swept up bags and bags of shavings and scraps and dust. And we had to sort through all of the tools and equipment and materials to separate what belonged to the Wood Turning Center and what belonged to the university. We also went to the Wood Turning Center to turn in our artist statements and corrections for the labels and to check out the installation. I had one piece, called “In Her Dream,” that required special installation, as you can see below. 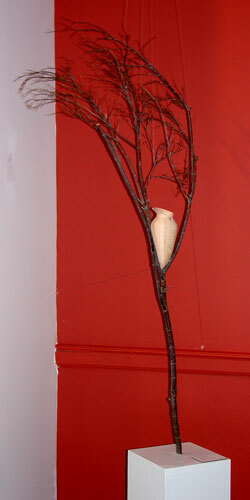 The shadows in the photos are distracting, but I’m really pleased with how the piece and branch seem to float. I also videotaped Sean, Siegfried, Jean-François, and I talking about the work and our ITE experience, which I later turned into a Quicktime movie. I lack the software here to convert it into a format suitable for uploading, but I will continue working on that. 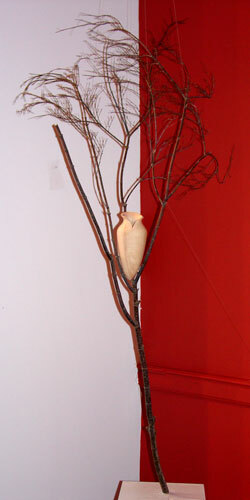 It is available for viewing at the Wood Turning Center. Thursday evening, August 2, all of us except Lesya—Peter came in from New York a day early, and Elisabeth pulled herself away from the museum—met with Albert at the Wood Turning Center. The purpose of the meeting was to discuss what single piece represented for each of us our ITE experience. 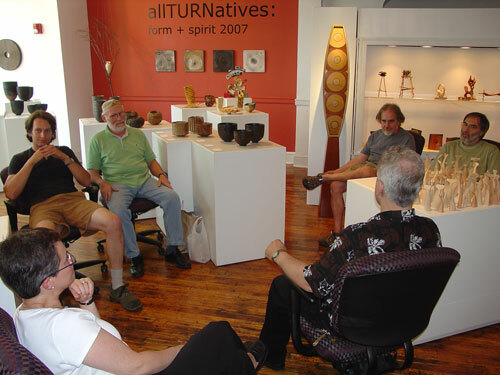 The Wood Turning Center was acquiring a piece from each of us for its permanent collection, and the input from us would be considered in determining what those pieces would be. To backtrack a little, Jean-François, Siegfried, Sean, and I had met individually with Albert on the previous Sunday to discuss our ITE experience and the work we had produced. Speaking for myself, it was an enlightening conversation. Talking through my pieces chronologically with Albert helped me see my experience as a whole for the first time. The conclusion I reached in that conversation was that there were two pieces that represented my experience—“Offering,” the first spouted vessel I turned, and “Learning to Cope: Pear Incognito under a Mantle of Cherry”—and I leaned toward the latter as the ultimate choice. The purpose of the meeting wasn’t for each of us to say what piece we would choose for ourselves, but to hear what everyone else would choose for us—that is, to hear how our fellow ITErs perceived our work and our experience. The discussion was fascinating. It was a challenge to look objectively at each other’s work, to set aside our personal preferences and look at the work in the context of the individual artist. Being away from the rest of us gave Elisabeth and Peter interesting perspectives. In particular—though perhaps not surprisingly, given her training—Elisabeth seemed to see each of us the most clearly. Some of our views were widely divergent to begin with, but in the end, we seemed to reach consensus on everyone. 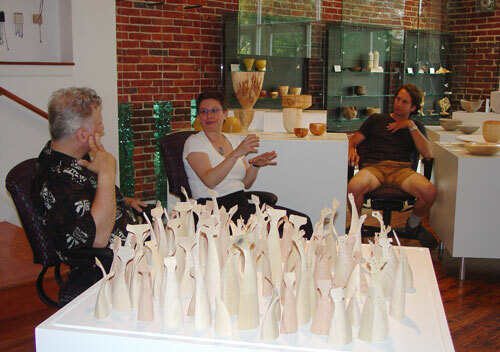 For me, the piece everyone settled on was the cloaked pear bowl, and that is the piece the Wood Turning Center did acquire. I hope that the Wood Turning Center will indicate on their site which pieces were acquired for each of us, because in the blur of the opening, I didn’t register what they were for the others.